The Levine Museum of the New South in Charlotte, North Carolina is a fascinating showcase of the countless personalities that call this place home. 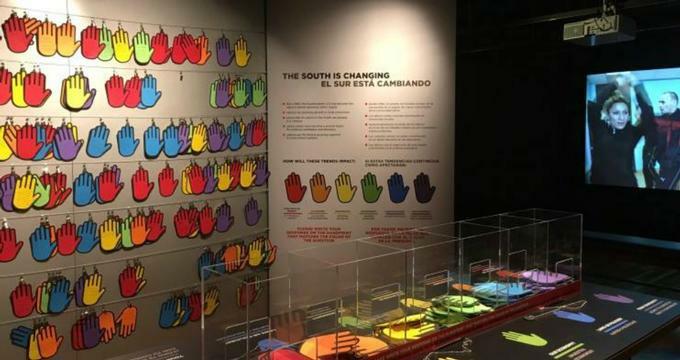 The museum looks to the history of Piedmont, which suffered from a number of racial issues and segregation following the American Civil War, and seeks to enable both the community and guests to gain a deep insight into past with its exhibits, materials, and interpretations that collectively tell the history of Carolina Piedmont. Past exhibits at Levine have been hugely historical, such as the one focusing on Robert Smalls, who was a civil war hero and congressman. The Life and Times of Robert Smalls brings into existence the man who was once enslaved but became free and this multifaceted exhibit documents the life of someone who passed through trials and tribulations through the use of memorabilia, artefacts, and compelling images. The Storied South: Voices of Writers and Artists was a past exhibit that featured photographs taken by Dr. William Ferris. Other compelling past exhibits have included ¡NUEVOlution! Latinos and the New South, Out of the Shadows: Gay America from Kinsey to Stonewall, and Faces of Freedom Summer. Current exhibits include The Volunteers: Americans Join World War I, 1914–1919, which looks at those who risked their lives to fight for a cause. Cotton Fields to Skyscrapers looks at the post-Civil War period, with almost 1,000 images, clips, music, oral histories, and artefacts. Divine Signs looks at Christianity and the strong impact that it had on the South, while Looking at Appalachia demonstrates the effects of poverty in the 1960s. There is also the ‘K (NO) W Justice K (NO) W’ piece. Adults and children can visit the museum to learn more about past, present, and future, and the Levine Museum of the New South also works with schools, scholars, educators, and community partners. There is a book club, and the Breaking Bread event, which is a delicious meal involving interesting conversations and thought-provoking dialogue. There are also tours, outreach programs, internship opportunities, and resources that are provided by Levine to help those seeking a more in-depth guide to American history.